OK, so this was the virgin trip for my new (old) FJ40 (previously owned by Brandon B, thank you very much). 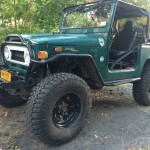 I had to drive to RC from LI, wheel, and drive back. First big travel test for my new (old) 40. I have to say it did real well on the travel. Aside from being in what I imagine it would feel like being in a wind tunnel for 4+ hours each way, and praying on the hills that I wouldn’t have to go any lower than 3rd gear, it was really not too bad. It only took me 4:30 to get there and 4:15 (record time) to get back. Yes it was bouncy, noisy, uncomfortable, whatever. It was worth every minute of it for the virgin ride. Unfortunately for anyone reading this, I wasn’t real invested in the picture thing. Fortunately, there are some pics, which you will see in a bit that were taken by Deb from VT. I stayed in the usual non-CMCC cabin at TG. Nice location, babbling brook, solitude. Arrived at RC at about 1 PM Friday ready to do half a day. A few trucks were lined up near the check-in shack. Beautiful day, t-shirt weather (or close to it). Got a late start, so we didn’t cover too much ground, but we had a blast. Had a chat with a couple of Keystone Cruiser guys (Andy and Jodi I think). We talked about Anthracite and how it’s shaping up nicely. They go over there once in a while. Talked with Gary S on Saturday about this also. The big problem seems to be that you need to be familiar with the trail network so you know where to go where you are either challenged or not, depending on your preference. Gary said he’d be willing to take some guys over there next time we are out there and show us around some of the better places he’s found. 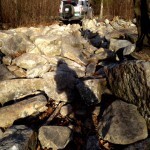 Chris M and Deb from VT. and I decided to start on the West property and do Pizza Rock and the Rock Garden. Chris led, I tailed. Headed out in traffic, cut through trail C to avoid it and started out on the short climb down the rocky hill at the bottom of the Pole Line where you can go 3 different ways. We took the hardest way down, no issues. Made our way over to the West property and had to detour a bit to avoid the loggers, who were clogging up the junction of 11 and H. It’ll be good when they are finally done. They have made a total mess out of the place. We saw that at Coal Mine back in July, especially over by Cemetery and Boot Hill. Finally made our way to 18 and got to Pizza Rock. Chris tried a crazy line a couple of times but had to revert back to the usual. No issues, we all got over and took the requisite pictures. This was the initial line, trying to come in on the steep side from an angle. Deb made it up with no problems, but I see some bumpers in her future. She was banging the front bumper on approach, and it’s just a matter of time before she has to upgrade. I didn’t really have any problems getting up either, other than I need to start running at lower PSI. I was at 8, but didn’t seem to be grabbing real well. I’m hoping it’s the PSI and not the fact that I’m used to the Swampers on the old truck. We then decided to tackle the Rock Garden. It’s about 100-150 yard wash of rocks, like a mini-Rock Creek. Deb wanted to try it, so we said we’d try it and see how it went. Chris got through no problem. We scouted out a route for Deb and got her through OK, she banged her diff a couple of times, but other than that did real well. Chris “adjusted” the diff skid mount to get it off the driveshaft. I got through fine, getting used to the 40. Pretty much point and go. It’s set up real nice. The biggest problem for me so far is getting used to the pedal placement. Sometimes when I hit the brake I also hit the gas. Have to re-train my feet so I don’t make a bad mistake in an unforgiving spot. 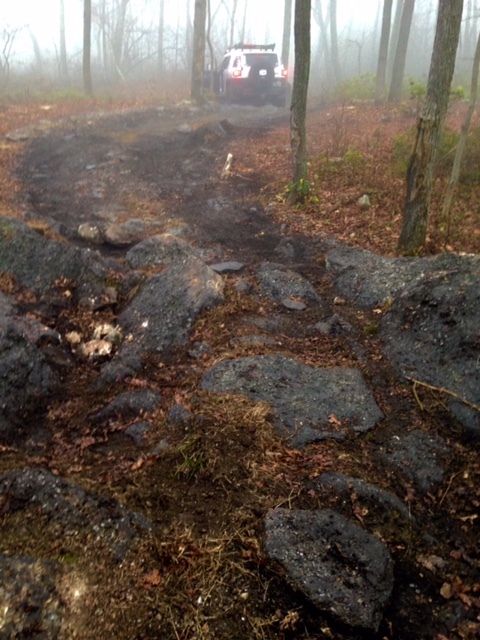 We finished up on Stout, another spot where the loggers have “modified” the trail network. Still fun, but we missed a turn somehow and only managed to find half of it. Again, no real carnage other than stopping a couple of times to make “adjustments”. Day 2 was a full day. Not as perfect a day as day 1. Not really cold, but it was a little drizzly all day, which made the rocks slick. Started out the day meeting up with Gary S from Keystone Cruisers. Gary didn’t bring a truck and rode with me. Great to have company and a navigator so I didn’t have to keep looking at the map. Group of 2, me leading and Chris following. Unfortunately, not many technical pictures. 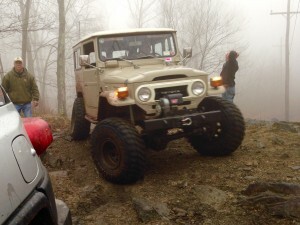 Headed out toward Jotters Way, but the trail was clogged, so we tool one of the hill climbs. I had my first encounter with tippiness in the 40. Got about half way up, lost traction and slipped back. The passenger rear caught up on a stump and the front swung to the left putting me almost sideways and at an awkward angle. No movement possible to reset, so we winched out of there. Chris made it up no problem. 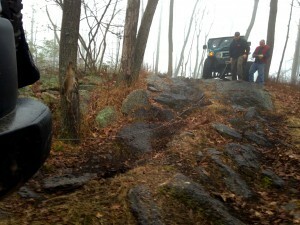 From there we headed over to the West Property to do trail 20 (Pitman’s Rock). Cut down 12B, hopped out on 15, and then up 11 to the start of 20. 20 is a great trail. 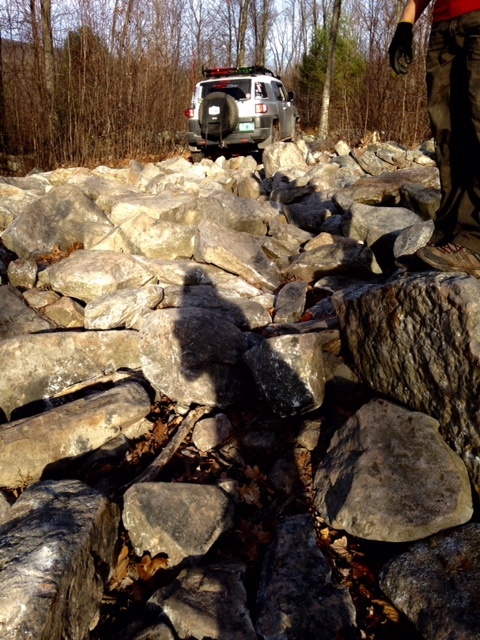 Lots of tough spots, and of course Pitman Rock at the beginning. Chris tried going straight up the rock. He’s got some good pics and videos, if I can get them uploaded here I’ll add them to the report. He didn’t make it over the top, but got pretty vertical. After a few attempts trie going around to the right. I remember that he got pretty tippy, but I’m pretty sure bailed at some point and took the usual route to the left. We got through the rest of the trail (actually only about half of it) and decided to do 23 and 10. These were fun trails. 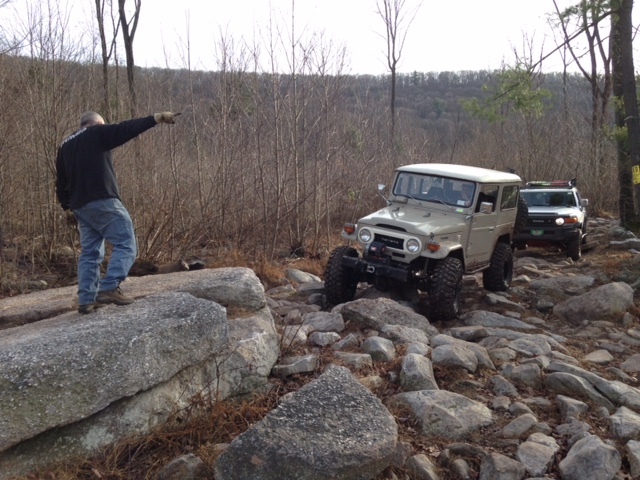 I let Gary drive the 40 for a bit to get his take on it. He seemed to think it was set up nice, very similar to his 40. We finished up over by Big Rocks, which Chris climbed nicely and I couldn’t get over. His linked rear seems to give him a little more ability. Hmmm. Something to think about. We wanted to do the front part of 12, up the hill and around to the right. As we got up to the top near H we saw a largish FJC group led by Rich L, so we popped out to say hi. Ran into Deb again, she wanted to join us and step it up a bit. Gary had to get out of the park by 2, so we decided to make our way over to the staging area, drop him off and go out again. On the way back we cut up 12c. Gets a little steep between a tree on the driver’s side and a big rock on the passenger’s side. Gary spotted Deb through fine. He turned and started to walk away and Deb lost her concentration for a second, misjudged the rock, and tagged her door (mostly a scratch, should buff out). Other than that, got back fine. Said goodbye to Gary and decided to do trail 5 and maybe the CV trail. 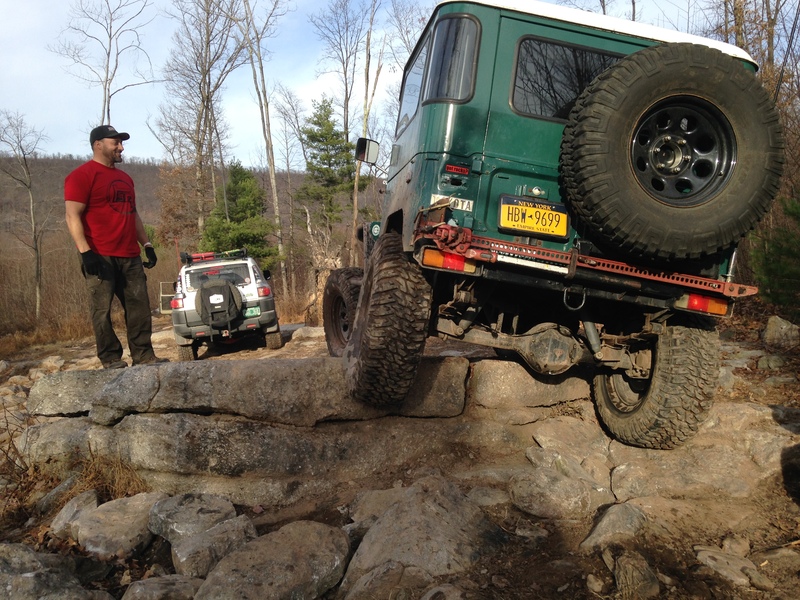 Needed to winch Deb out of a sticky spot just after the first big rock outcrop (twice), but otherwise had a great time on some challenging sections and made our way over to the hillclimb area at the end of trail 5. 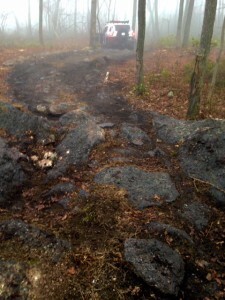 We all took different paths through the hillclimb area (going down and across). Chris did a section that took him into a deep rocky hole, which he did twice. 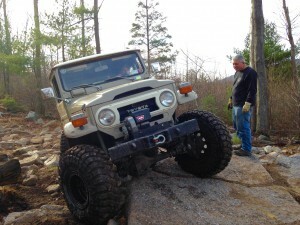 We got Deb through ok. Definitely challenging for the FJ, but Deb and the FJ both did great. Almost did a taillight, but Chris’s good spotting got her out damage free. Headed down CV (another logging nightmare) on the way back to the staging area, but Chris wanted to try Walk in the Park so we headed over there even though it was getting late and we knew better. Chris got himself buried in a hole pretty good before I got over to spot him, but we managed to get him out and pointed up Walk in the Park. The slick, wet rock proved a bit too much. Just couldn’t get any traction, and we winched him up. 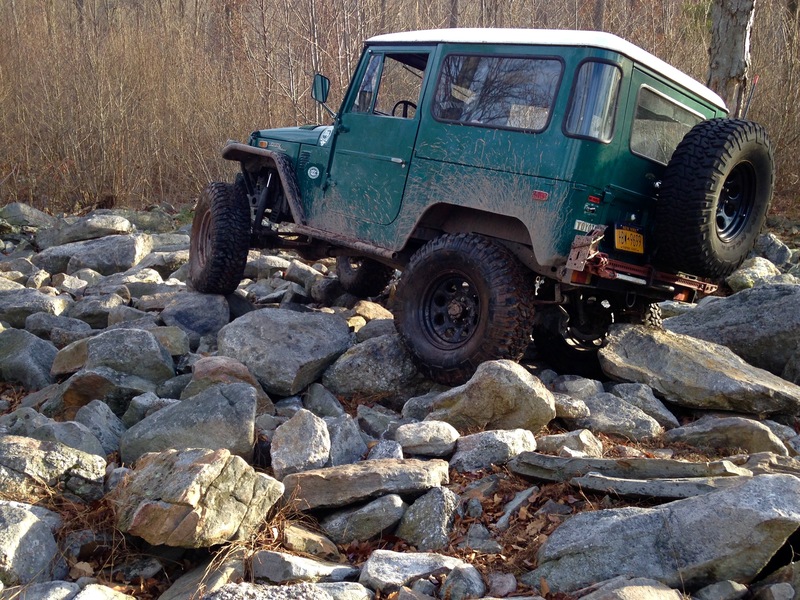 We will try that again next time on some dry rock. Getting dark, we headed back and called it a day. Great weekend with great company. Love the 40. Not too much damage. Now that I’m back and assessed things. I have a weepy transfer case (not too bad), a weepy rear hub (not too bad), and a bad front wheel bearing (not too bad). Just took care of some electrical issues, wheel bearing next so I can drive, then the minor leaks. Can’t wait to get back out.